Successfully Added Ordro 503 Car DVR - Full HD 1080P, 1/3 Inch SONY CMOS, G-Sensor, Motion Detection, Loop Recording, Micro SD Slot to your Shopping Cart. 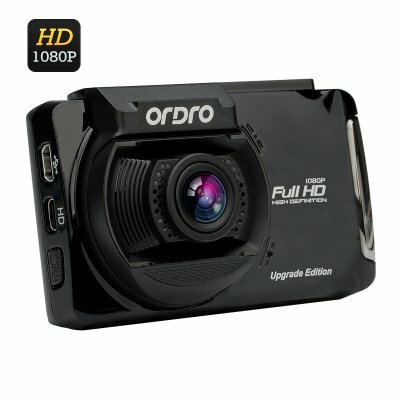 The Ordro 503 Dash camera features a 1/3 inch Sony CMOS sensor that provides great 1080p 30 fps video recording. With H.264 compression the captured video can be safely stored onto a micro SD card so you can document your journey. All the footage can be played back via the 2.7 inch LCD screen or transferred to a computer or TV for reviewing later. With a 170 degree wide angle lens you can easily position it to get a full view of the road ahead and its compact design ensure it won’t obstruct or interfere with your view. Coming with everything needed to mount it on your windscreen or dashboard the Ordro 503 will record every detail you need. Thanks to the built in G-sensor this action camera can take note of sudden moments such as sharp breaking or a violent swerve and will also lock the video at the time to prevent it being inadvertently recorded over if in loop recording. This can all be recalled easily at the side of the road to provide undisputable video evidence in the event of an accident. This vital information can be instrumental in resolving a claim and proving you were not a fault. You can even remove the camera from the windscreen and use it to take high definition 12MP pictures so in the unfortunate case of an accident you can take photographic proof details outside of the vehicle, such as damage and road conditions. The camera with its built in 400mAh battery can last for 30 minutes without a charge and comes with a long USB car charging cable so you can easily take it with you when you leave the car to snap some photos of the wonderful places you travel to. The Ordro dash cam features loop recording that can be set to 3, 5, or 10 minutes and the auto white balance helps ensure the correct exposure. With automatic recording support the camera will automatically start recording when the ignition is turned on which is one less thing to have to remember. This excellent little dash cam is a great way keep track of the road ahead and help insure yourself against any mishaps. The Ordro 503 dash cam comes with a 12 months warranty. Brought to you by the leader in electronic devices as well as wholesale Dash Camera, Chinavasion..